V-stitches are so easy to make and they are so beautiful. You never know how easy it is to make by looking at the finished product. And have you ever combine two different type of yarn in a project? here I used Red Heart with Love and Red Heart Super Saver. I choose this yarn not because of the type but because of the colors and the availability. 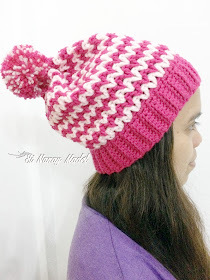 So here is my quick and easy V-stitch hat. 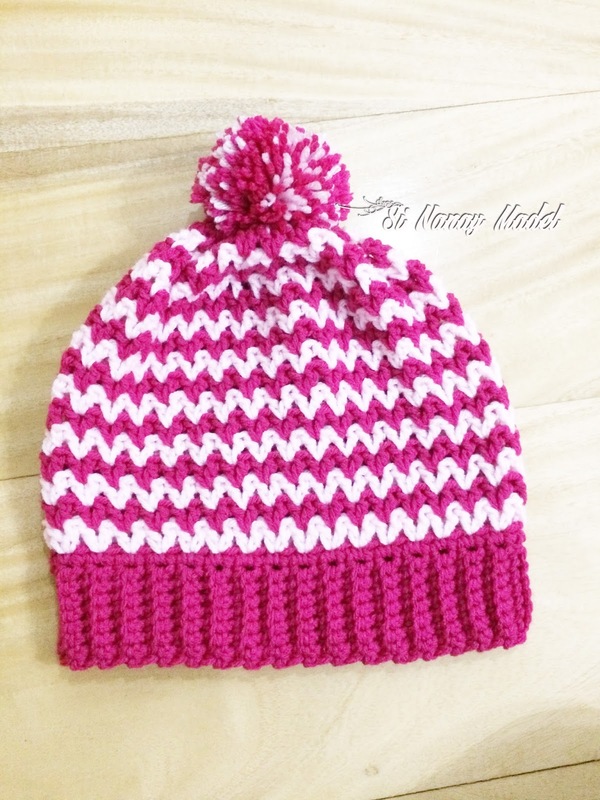 Hope you all enjoy making this hat. This Pattern starts from the ribbing and working in rows then after the ribbing will be working in rounds. Row 1. With the Color A. Chain 9, sc in 2nd ch from the hook. SC in all stitches (8sc). Chain 1, turn. Row 2. SC in first st. SC in next and the rest in BLO. Chain1, turn. Row 3- Row 60. Repeat Row 2. Then join both ends of the ribbing together with by sl st each st together or you can also whip stitch them together. Whichever you like. Then we will work in round this time all the way up to the top of the hat. Weave all ends and fasten off. Round 5-Round 12. Repeat Round 3 and 4. You can add more rounds if you want your hat to be more slouch than what I've done. Round 17. Chain 2, dc in next V-stitch, dc in all v-stitches. Join with a sl st on top of the first st. (16 dc) Cut yarn and leave a long tail for gathering the crown or sewing the hole at the top close. Make your pompoms and attached it to your hat. It may look too complicated for you but as you go along you will know that it is a very easy pattern. I love this stitch and I might make more project out of this stitch. So stay tuned. That's it, I hope you all learn something and enjoy this post. If you have any questions, comments or suggestion just leave a message in the comment box and I will gladly answer them. And don't forget to Tag me on Instagram and Twitter with your finished project and also like my Page on Facebook, Si Nanay Madel. I would love to see what you've done and Pin it also on Pinterest. Thank you and God bless! Don't forget to share on Facebook, Pinterest, Twitter and more. Go check my Ravelry Store for more patterns. **Please do not copy and post any pattern from this blog and claim it as your own. This pattern is limited to personal use only. Please do not re-publish all photos from this blog as your own. You may make and sell products from my patterns. Please also link back to my post. Any link back will be much, much appreciated. Thank you very much. On row 13, am I working in between the previous rows v stitches or in the v stitches? This looks adoarable! I'm looking to make a Bronco themed hat for my son. He's 4. In order to make it smaller how should I do this? Thank you so much for sharing this pattern. Ok thanks! I asked 4 more rows and am now doing the V stitch for first time and you are right it's easier then I thought it would be when I read the pattern! This is so pretty! Thank you! Can you tell me if you cut the yarn after each row or do you carry it through under the stitches? Thank you! Hi.. Sorry for the delayed response. I did not get to see your comments here. Sorry for that again and thank you for being here. I carry my yarn through. I hate weaving the ends..lol. I’m stuck on row 14 I can only get 18 V stitch in row 14. What am I doing wrong? Should the pattern read, Row 3 - Row 6 (instead of Row 60)? When I look at the hat it looks like 6 rows, not 60. Hi.. Sorry for the delayed response. I did not get to see your comments here. It is 60. That is the ribbing/band of the hat. it is worked in rows. so up to 60 rows to fit the average Adult head.